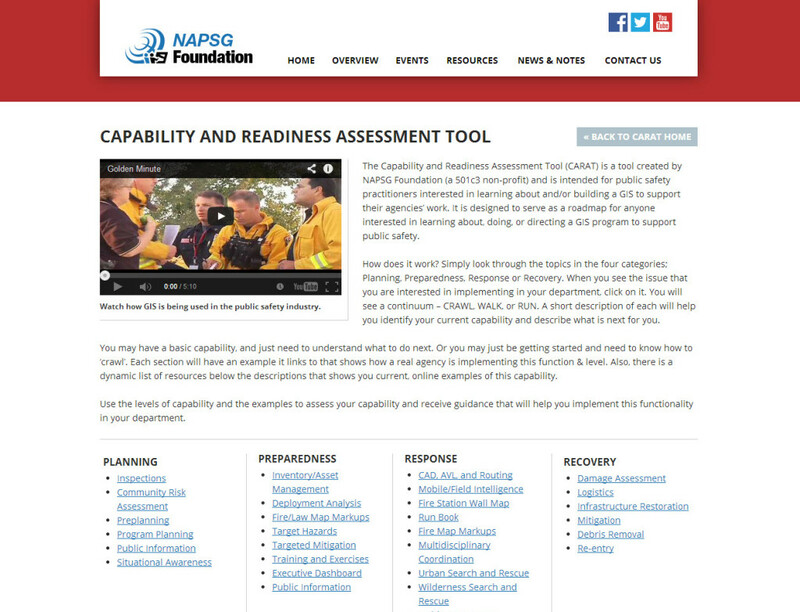 The NAPSG (National Alliance for Public Safety GIS Foundation), a not-for-profit organization specializing in preparedness, mitigation, response, and recovery in the sphere of public safety, recently launched its redesigned website with the Capability and Readiness Assessment Tool (CARAT). Built in partnership with Blue Raster, Interra Group, and a number of other Geospatial Management Organizations, CARAT provides public safety practitioners with information on building, directing, or enhancing a GIS program. The tool uses the simple continuum – Crawl, Walk, or Run, to help decision makers identify their current GIS capability and conceptualize potential areas where GIS could improve operations. Topics are sorted into four categories: Planning, Preparedness, Response, and Recovery, and case studies are offered to help users implement similar functionality into their work. CARAT’s design makes it possible for anyone, from basic capability to advanced problem solving, to connect with this dynamic knowledge base. The repository of people, tools and experience offers public safety practitioners a comprehensive guide for integrating GIS into their daily operations. To learn more, visit http://napsgfoundation.org/carat/.